Sorry NO We have found results in this Province. But we show you suppliers that may interest you ..! We offer clothes for babies of the best brands. We are a touristic company that offers recreational services of swimming pools, sauna, Turkish, hydro massage, ecological paths and gyms, strengthened in principles and own values, as well as giving to know the majesty of the canton Baños de Agua Santa. Enjoy the best burgers, hot dogs and chips in Baños de Agua Santa our years of experience have always allowed us to be the best. We are located a few steps from the Terrestrial Terminal. In our community you will be able to enter into direct contact with nature, while you make our whole journey between hiking and sport fishing. We offer comfortable and fully equipped rooms for your rest, at the lowest cost ..! The name comes from an indigenous tribe called Jama, which means small iguana. According to studies carried out by archeologists from the University of Pittsburgh, the Jama culture is the oldest and most advanced in Latin America. The beautiful Jama canton is an example of development for the province of Manabí and the country in general. Its main source of income is the production of shrimp and fish for export, which is in high demand in European countries. The Jama culture is one of the oldest and most advanced in Latin America. The cuisine that this destination offers tourists is varied and we find dishes such as: Tonga, Curd and Creole chicken broth. Among the tourist sites that this beautiful place has, for example: the beaches of Matal, Cerro Nueve and Hacienda Stableus. Jama is a development pole for the province of Manabí and the country, generates jobs and income from foreign exchange, through the production of shrimp and fish for export. It also has agricultural, livestock and unparalleled tourist wealth. The Jama River forms an extensive hydrographic basin, which empties into the Pacific Ocean, it is part of the seven main estuaries that the Ecuadorian coast has. The Tabuga, Camarones, Tasaste, Punta Blanca, Mariano and Jama rivers are located in the estuaries system. Cultural Archaeological Museum of Jama. This is a tropical dry primary forest with an exuberant flora in the same way its fauna is very varied. Place for the practice of ecotourism, observation of flora and fauna. The Forest is one of the few remnants of Dry Forest on the coast of Manabí that is preserved almost without alteration. Different habitat of dry, semi-dry and semi-humid forest. The station has close access to beaches of incomparable beauty. Picturesque place of greater affluence of tourists especially on holidays and weekends. Its wide beaches, the honesty and kindness of its people, and tranquility with which you can enjoy a healthy environment make this a place to visit throughout the year. El Matal is the second Artisanal Fishing Port in the province, where around 60 daily tons of fish of different species are slaughtered, most of the production is destined to Santo Domingo, Pedernales, El Carmen, among others. Spa of fresh water ideal site for climbing, ecotourism practice. It is preserved naturally and has not undergone alterations of any kind. Getting to the place is easily accessible by land. It is surrounded by a thick vegetation endemic to the area such as laurel, balsam, guabos, pechiche, among others and among its fauna we find armadillo, squirrel, sloth. In winter time it is very large. On the banks of the waterfall there are places to camp and take walks and in the same way there are viewpoints to rest contemplating the landscape and at the same time taking photographs. The jump enjoys primary forest, and a varied fauna where the aquaculture activity is developed. The contrast of fresh and salt water makes this place a favorite destination for tourism. With its quiet and clean beaches for tourists to enjoy this beautiful corner of the Ecuadorian coast. Its beach is not very extensive where you can see forms of rocks that have detached from the coast. The place can be accessed by sea and land. Ideal place for photographs and rest. The contrast of fresh and salt water makes this place a favorite destination for tourism. 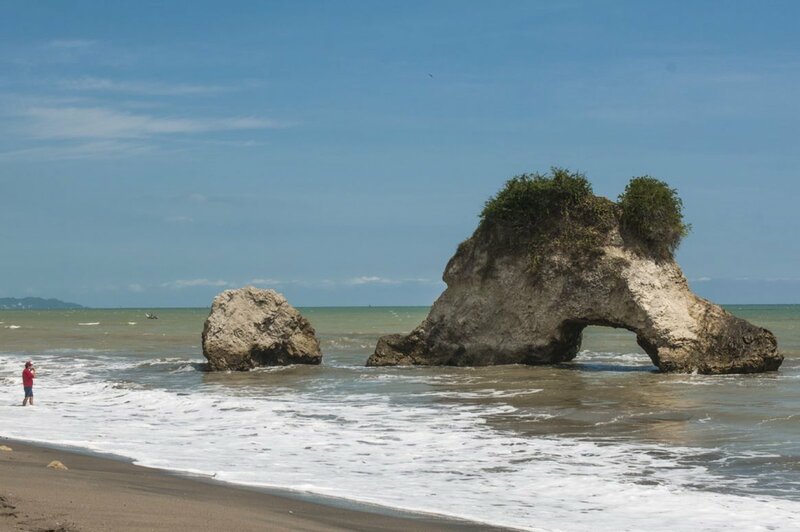 With its quiet and clean beaches await tourists to enjoy this beautiful corner of the Ecuadorian coast. This approximately 16.5 km from the Jama cantonal head, in Tasaste you will find cabins where typical Manabita food is sold, there is also an estuary of fresh water and bathrooms with public showers. Tonga de pescado.- is a Creole chicken stew wrapped in banana leaves and ready to be served. Creole chicken broth.- The traditional creole chicken broth cooked in a wood-fired oven is in Jama the star dish of local cuisine. Without much seasoning, with yucca and some coriander branches, accompanied by roasted green, is how the broth is served in local houses and dining rooms. White whey. Jama's cuisine takes advantage of the livestock tradition and the production of dairy products. The result is the exquisite and representative "white serum". It consists of curd (soft cheese), buttermilk and white butter. It is served with green or ripe roast. Other meals.- its gastronomy is varied. They range from dishes based on seafood, freshwater fish, to Creole chicken broth and dairy products, such as: shrimp and fish ceviche, corn tortilla, corviches, among others. We are the first Virtual Guía Turística y Comercial de Ecuador to incorporate strategies for the marketing and promotion of establishments and services in a flexible and timely manner..!